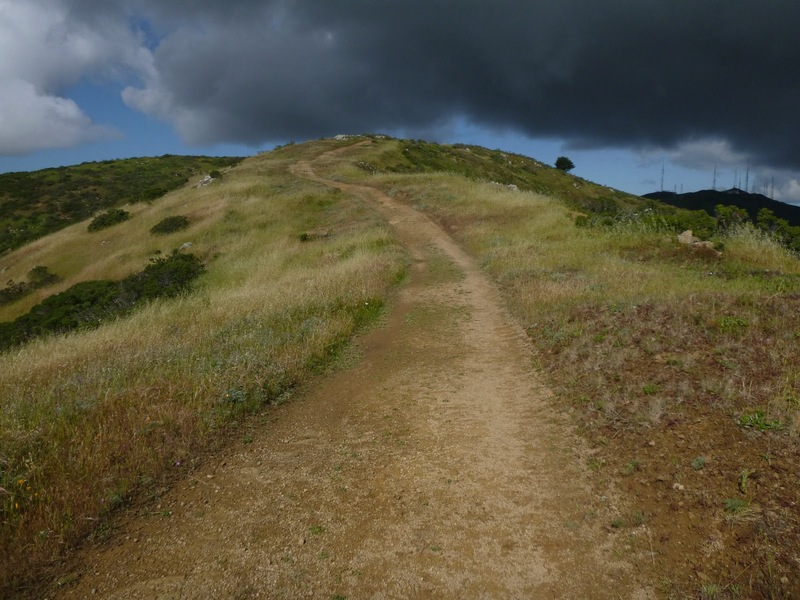 I love San Bruno Mountain, and in particular the trails on the south side of Guadalupe Canyon Parkway. It's been easy to fall into a routine when I visit, either alone or with my son and husband. We always are happy to hike Summit Loop or the trails flanking Dairy Ravine. My son is out of school for spring break and today we left the house intending to hike Summit Loop, but on the way to the mountain it started to rain. We were listening to a cd ("the Name of this Book is Secret," one of my son's favorites) and content, so I proposed a drive to the end of Radio Road, killing time until the rain stopped. The rain ceased, we reached the end of the chapter and also the parking lot at the terminus of Radio Road. Oh the view from this spot! It's spectacular, and we changed our plans on the spot, heading out on Ridge Trail. I have been on this trail once, many years ago, but didn't remember it at all. The broad fire road (closed to bikes, and sorry, dogs as well) climbs up and down small knolls as it runs along San Bruno Mountain's southeast ridge. We crossed paths with not a soul on our 3 mile out and back hike. Checkerspot butterflies flitted about, ravens floated by on thermals, and we watched dark clouds hang over the mountain but then move on. Ridge Trail begins descending through coastal scrub, but a bit after the one mile mark there is a transition to grassland. Wildflowers were blooming everywhere, including the last San Francisco wallflowers of the year, iris, California poppies, seaside daisy, cow parsnip, and paintbrush in varying colors. Out in the grassland owl clover was abundant. 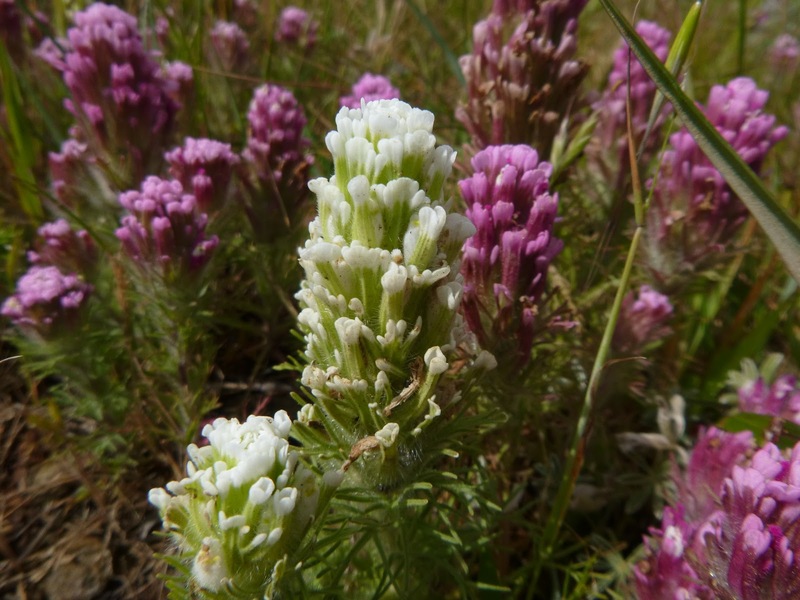 Mixed through the familiar pink flowers was a solitary white version -- albino or a Castilleja new to me. Native flower (and hummingbird) fans take note: there is tons of Salvia spathacea (hummingbird sage) along this trail, more than I have seen anywhere else in the bay area. It is blooming now, with many new plants set to bloom in the next month. Views along the trail are outstanding; on clear days you can see for many miles. We loved the hike so much we might go back later this week and hike to the end of the trail, which is a little over 4 miles round trip. Hi, I have read your content & found that is very much informative for us. Thanks for sharing.